The recent best news in the country is our petrol price has dropped slightly and yay to motorists and motorcyclists! Unfortunately the price of our goods in country has not dropped yet hence we still need to spend our money wisely to maximize our Ringgit value! I bet you know I love shopping very much... ahem oh ya I'm the shopping queen that helps Malaysia economy growing yo!And there time that I overspend without knowing when I just swipe only my credit card...without tracking what did I use.. and you know by the time you receive your credit card bill... it's too late to change anything... so eating bread to pay off the bill! Speaking on experience, honestly if you are not a person who knows self control then having credit card may not be a good thing though it's nice to go cashless. You know how convenient nowadays you want to go cashless and go and sign up a credit card. While it' fun to swipe swipe swipe the bills all along the way, hey still got to pay the bills okay? And if you don't pay the credit card bill on time you will be charged interest, late payment fee etc... and then run the chances of being blacklisted for future loans! Ahem my new flats - nice or not? 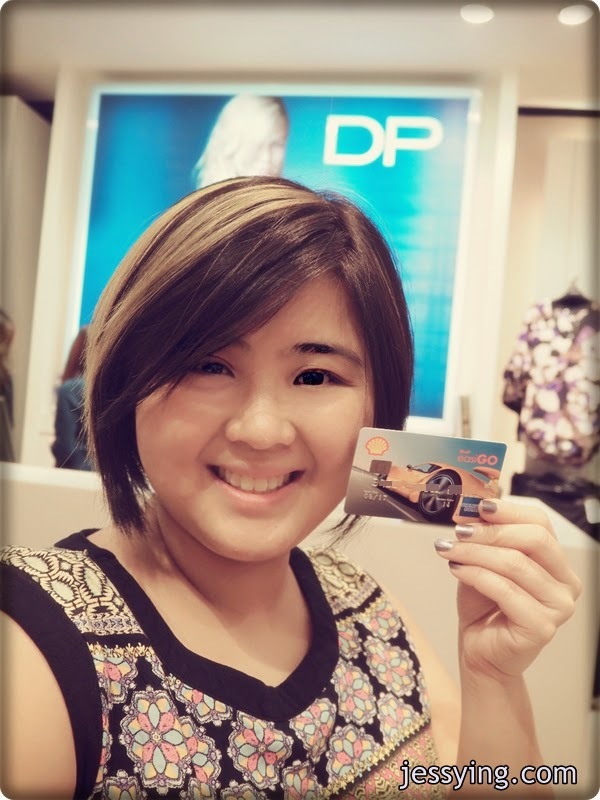 Hence with this Shell easiGo American Express (Amex) Prepaid Card I am able to spend smartly by prioritising my expenditure, spend within means (only spend the credit that I pre-loaded in the card) and hunt for the best deals in town lah! Also in case you ran low in cash, you can also withdraw the money from the card at any Maybank ATM machines near you as long as you apply for the the PIN for Shell easiGO Prepaid Card from selected Maybank branches. Personally I think this card would be great for college students because instead of giving them sub credit card (which they might overspend it), parents can now opt for this Shell easiGo American Express Prepaid Card where they can top up certain amounts for their kids to spend every month. Not only their kids can have a secure, smart and convenient cashless way to refuel their car and to shop, their parents can keep track of their children spending habits. Hehe... very good way to practice good spending habits! Although this is prepaid card, Shell easiGo American Express Prepaid Card also allows user to collect AMEX treats points which can be accumulated ... 1 x TREATS Points for every RM3 spent using the Shell easiGO Prepaid Card!!! And you can use the points to redeems products at Maybank online or their annual Maybank Treaty Fair too! So whenever you pump in your car with of Shell V Power or Shell FuelSave 95, not only you can refuel your petrol cashless using this Shell easiGo American Express Prepaid Card but it is also efficient and time saving too! Not forgetting that you are also collecting but you collect treats points at the same time too! Not only that, you also get to enjoy up to 10% exclusive discount from Shell on Shell lubricant products at Shell Select stations and each card holder entitle to enjoy complimentary 1 year Personal Accident Insurance (Total and Permanent Disablement benefit only) up to RM15,000! So how to apply Shell easiGo American Express Prepaid Card? No need your salary slip or EPF statement! Just buy Shell easiGo American Express Prepaid Card starter pack at any Shell stations today as long you are 18 years and above with a valid address in Malaysia. And the annual fee is only RM6.00 ( with RM0.50 will be charged to the Shell easiGO Prepaid Card on monthly basis). Just buy Shell easiGo American Express Prepaid Card starter pack at any Shell fuel stations today, complete the form and submit the enclosed application form to Maybank together with a copy of your NRIC! An sms would be sent to you once your card is activated. You can start using the card by reloading your card at any Shell stations, any 3,000 Maybank's ATM & CDM machine nationwide or even do it online at www.maybank.com.my . PCBAL (space) first 6 digit of card number <#> last 4 digit of card number <#> customer ID. Send to 66628. And if you apply Shell easiGO Prepaid Card today, you might be in the running to be one of the 1,500 winners each month to win RM100 cash prize. So now, I'm going to go reload my Shell easiGo Prepaid Card and to continue shopping for my Chinese New Year's clothing! Let's GO and HUNT for the best deals in town!